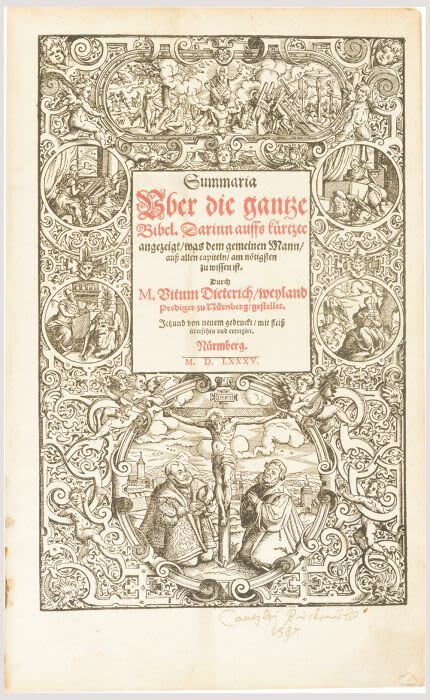 Elaborate title border with Martin Luther and Elector John Frederick of Saxony; the elector kneeling on the left, Luther on the right of Jesus on the cross in lower section, the four Evangelists with their attributes to the left and right of the title and in a cartouche in the upper border section from left to right: The Fall of Mankind, God and the Crucifixion. Scenes set in circular frames within an ornamental border. later full page woodcut of the creation of Eve. Touch browned. Contemporary limp vellum, lightly worn. Folio. Veit Dietrich, also known as Vitus Theodorus or Vitus Diterichus (1506-49), was a German theologian, writer and reformer. While in the University of Wittenberg Philipp Melanchthon recognized Dietrich’s talent and encouraged him. Later, he was Martin Luther's housemate and a close confidant. As such Dietrich accompanied Luther to the Marburg Colloquy and stayed with him during the Diet of Augsburg in 1530 at the Fortress of Coburg.